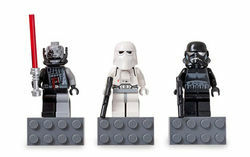 4560062 Dark Side Magnet Set is a magnet set, containing three magnets with a Battle Damaged Darth Vader (with chrome hilted Lightsaber), Snowtrooper (with a blaster) and Shadow Stormtrooper (with a blaster). The minifigures are removable from their grey magnet bases. Facts about "4560062 Dark Side Magnet Set"
This page was last edited on 9 January 2016, at 18:26.